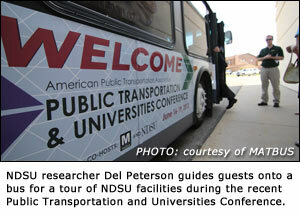 The American Public Transportation Association's Public Transportation and Universities Communities Conference was held June 16-19 in Fargo, hosted by MATBUS and Small Urban and Rural Transportation Center, a part of NDSU's Upper Great Plains Transportation Institute. NDSU students, faculty and staff were among the presenters, panelists and attendees at the conference. NDSU President Dean L. Bresciani opened the conference with a welcome to participants. Jill Hough, Small Urban and Rural Transportation Center director, was chair of the conference, developed and moderated a panel session focusing on workforce development in public transportation and moderated a session that highlighted the partnership between NDSU and MATBUS. Elvis Ndembe, a doctoral student in the transportation and logistics program, presented information from a survey and an exploratory study conducted by the Small Urban and Rural Transportation Center to evaluate passengers' ridership behavior if buses were equipped with wireless Internet connectivity. He spoke about different ways to enhance the quality of service at MATBUS with recent technological developments. Del Peterson, an associate research fellow with the Small Urban and Rural Transportation Center, discussed his research into the use of radio frequency identification technology to track and collect information from transit passengers. Brett Korporaal, a transportation and logistics graduate student, was part of a student panel discussion that addressed partnerships between universities and public transportation and how resulting services affect students. "The university-transit partnership is critical to creating, developing and promoting a culture of public transportation in communities across America," he said. "The partnership encourages students to think about and use alternative modes of transportation, which helps students and communities realize the benefits of a safe, convenient and reliable transit system." NDSU student body vice president Jace Beehler moderated the student panel, which included Luke Brodeur, NDSU student body president, and several other student leaders from around the nation. "This not only was a great way for the transit officials to learn what students were thinking about a variety of topics but also allowed student leaders to have many of our own questions answered," Beehler said. Rob Lynch, NDSU parking and transportation service manager, participated on a panel that discussed the development and success of the partnership between NDSU and MATBUS. Bill Vandal, NDSU chief of police, participated on a panel that discussed safety and security related to university transportation as well as implications for university transportation in emergency response. Hough noted that conference presentations and tours left participants favorably impressed with both Fargo-Moorhead and NDSU. She said public transportation received significant positive media attention throughout the conference, raising the profile of the topic in the Fargo-Moorhead area. The event also was a great opportunity for NDSU students to learn how other universities partner with transit providers and to see efforts directed at workforce development by both universities and transit agencies. "Universities play a vital role in the training and development of the workforce that is going to be part of the transit industry," said Ankush Agrawal, NDSU transportation and logistics doctoral student. "University-transit partnerships will ensure a better trained workforce with focus on the modernization of the transit industry." Michael Melaniphy, American Public Transportation Association president and CEO, said, "APTA is thrilled that Fargo chose to be the host city for the 2012 university conference. The people here have been great hosts. We are hearing so many great things about the community embracing them. This isn't just the university putting on the conference, it's the community putting on the conference, and that makes Fargo a great city to host this conference."